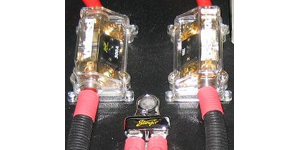 Keep your car stereo system and battery protected with one of our fuse holders! We carry a wide range of fuse holder options including AGU, ANL, MAXI, MIDI and circuit breakers to best fit your car audio needs. All fuse holders are available in a variety of power wire gauge sizes and platinum and gold finishes.